Designed to make your job easier. The Toshiba e-STUDIO170F is ready to go, right out of the box. It includes a standard USB interface, Windows PC printing, scanning, and a convenient setup utility that allows users to program the fax machine from a PC. Separate drum and toner components provide for a full life of the drum and easy access to supplies that are user replaceable. With everything the e-STUDIO170F has to offer, it is surprisingly compact. This small but feature-rich machine is the perfect choice for small to medium offices and workgroups. It may be small, but it's sure to increase productivity in a big way. A small facsimile system that thinks big. The Toshiba e-STUDIO170F is the perfect facsimile system to help make small and medium sized workgroups more productive. This hardworking, multifunction unit can fax, print, copy and scan. It faxes at an impressive rate of 3 seconds per page and prints at a speed of 17 pages per minute. Add to that a Super G3, 33.6 Kbps modem, 7 MB of memory, and JBIG compression. And that's just the beginning. Productivity is on the rise. Any small to medium office or workgroup can produce even more thanks to the e-STUDIO170F. There are 38 programmable, one-touch dialing keys so you can send faxes to commonly used locations. In addition, the 188 location dialer allows you to take advantage of 150 abbreviated/alphabet speed dialing numbers. An automatic redial makes sure faxes get to where they are going. Transmission is as impressive as dialing, with dual access, auto/manual contrast control, delayed transmission, batching and error correction, just to name a few of the e-STUDIO170F capabilities. Fax, copy, print, you name it. Whatever features you're looking for in a facsimile system, the e-STUDIO170F is sure to have them. 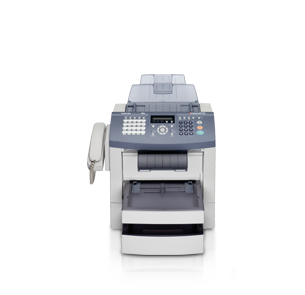 The standard multifunction features include fax, PC scan, and 600 dpi Windows® printing. Management features include account codes, department codes, confirmation reports, power save mode and remote terminal identification. If you're wondering whether or not the e-STUDIO170F can handle the job, you should know that it has a 40-sheet automatic document feeder, letter/legal output capabilities, collated printing, single sheet bypass and 250-sheet paper cassette. And in case that's not enough, you can opt for an additional 500-sheet cassette.